NARA T624. Thirteenth Census of the United States, 1910 population schedules. 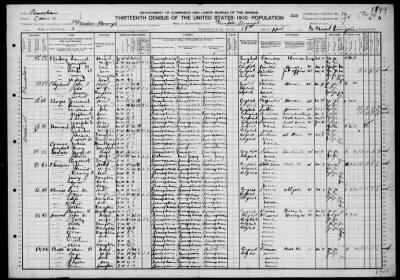 The 1910 census records those individuals and families living in a particular residence as of April 15, 1910. Of particular interest in this census is column 30, "Whether a survivor of Union or Confederate Army or Navy," which can help determine if pension and service records may be available for that individual.